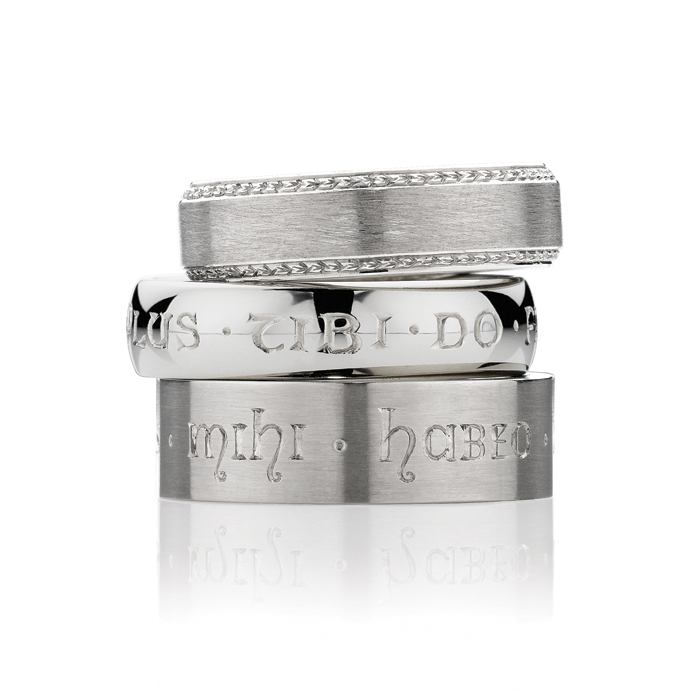 At Victoria Buckley we have an extensive range of men's rings that will appeal to the discerning gentleman. Our classic wedding bands are both beautifully crafted and competitively priced, made to measure in Platinum, Gold or the new all black Zirconium. We also offer bespoke, elaborately hand-carved rings, elegantly different in style and design. At Victoria Buckley we love to combine age-old techniques and new technologies – accomplishing an extraordinary level of detail by working under a high-powered microscope. Victoria has studied privately with Sam Alfano, one of the world’s Master Engravers, to help explore greater refinement in her designs. A wedding band adorned with intricate designs meticulously carved by hand will be treasured for lifetimes. Victoria Buckley offers an extensive collection of classic styles made-to-measure. Choose from Platinum, Gold or the new all black Zirconium. When given a raw satin finish our premium White Gold alloy has a clean modern edge that doesn't require plating, and contrasts beauifully with the timeless hand engraving. Our Yellow Gold and Rose Gold rings are available in both 18ct and 9ct alloys, offering a more affordable option that doesn't compromise on style or comfort. We invite to come and experience our beautifully crafted and competitively priced Men's collection in store. All of our popular styles of classic wedding bands are now available in black! Crafted from Zirconium and finished with an extreme heat to turn it black, the rings are tougher than Platinum, and more durable than Tungsten.